“Urubamba! 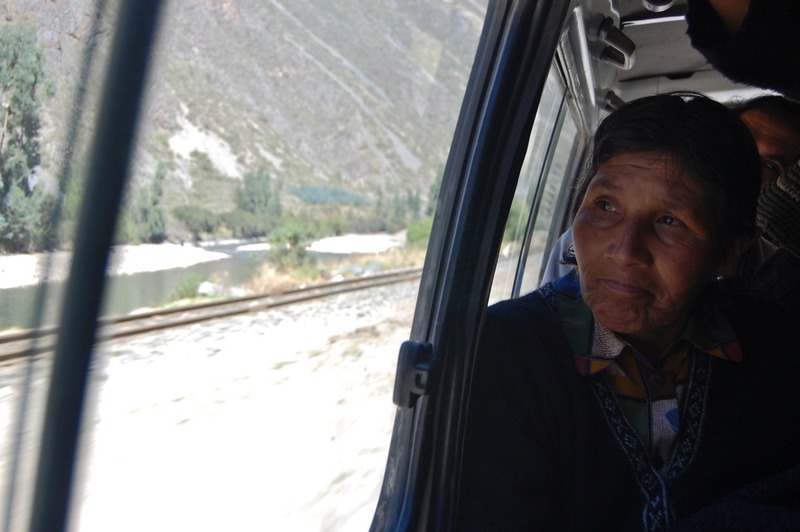 Urubamba!,” shouts the driver, announcing the destination of his combi (English translation: tightly-packed minivan that serves as the principal form of local transport in Peru). Ana Maria, the mother of my host family and I are off to a wedding in the village of Pacha, a few miles outside of town. We walk up to the village from the main road, carrying crates full of beer, a customary wedding gift that will help sustain the festivities a few hours from now. We pass through a construction site where workers are building a paved road that leads up to Pacha. The mayor of Urubamba, the largest town in the area, hails from this village I am told. His clout has helped to bring the paved road and electricity to the village in the last few years. At the end of a cluster of cinderblock shacks, a dirt courtyard has been transformed into a festive space for the reception. Brightly colored tents and a stage have been carefully erected for the occasion. We drop the beer crates off in the makeshift kitchen, and wander up the road to the village center and the church where the wedding is to be held. 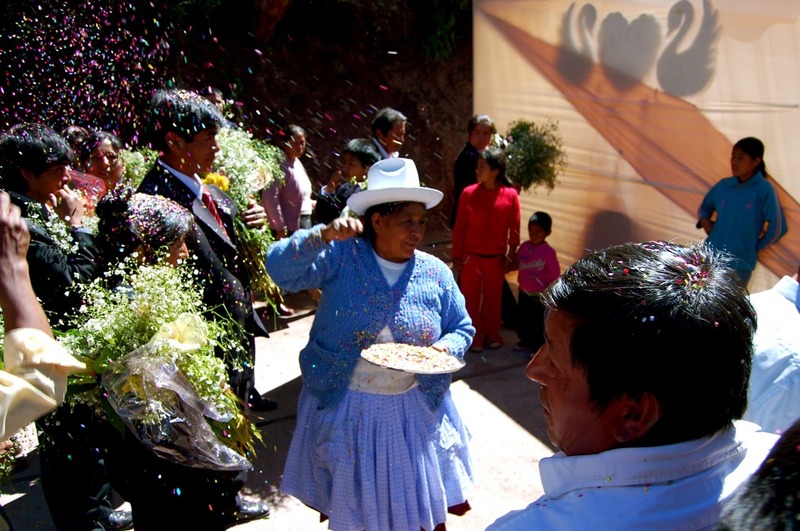 The bride and groom are still on their way from Urubamba. Family, friends, and neighbors pour into the church, coming from all over the valley and surrounding mountains. 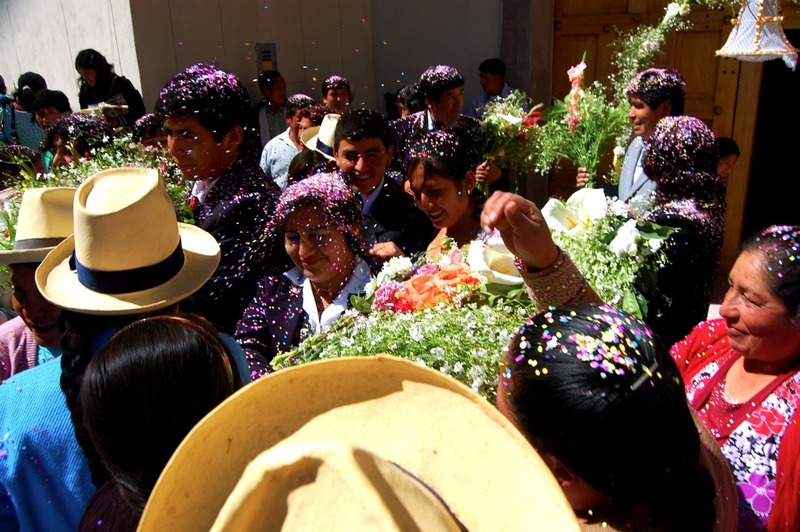 The priest says the wedding mass, and the newlyweds emerge out into the small square amidst a sea of brightly-colored confetti thrown from all directions. The crowd surrounds the couple and accompanies them down the road to the reception site, where a brief civil ceremony takes place, and the official state certificates of marriage are signed and the rights and responsibilities of marriage read aloud. The band begins to play as massive servings of roasted pig and potatoes are brought out to the hundreds of guests, two plates at a time. Soon after lunch is served, the alcohol begins to flow… first small glasses of frothy pisco sour, followed by beer, and finally, large vats of chicha (Peruvian fermented corn beer), served up in giant plastic containers. Members of the groom’s family, followed by the bride’s queue up for the gift offering, as the MC announces each gift as it is offered – a process that takes nearly two hours. The mayor of Urubamba is chastised for his meager gift of fifty soles. “Fifty nuevo soles, Mr. Mayor? Is that all you can give! ?,” asks the MC to the amusement of the crowd. As dusk falls, the alcohol continues to flow, and the music and dancing intensify. Hastily wired lamplights at the corners of the tent flicker on and off and finally stabilize, setting the stage for many more hours of celebration into the night. As dinner is starting to be served up, Ana Maria tugs at my sleeve and says, “Let’s go, now! There’s a car going to Ollantaytambo! Come on!” As we push through the crowd and out of the tent, two of her friends thrust our dinner plates in front of us for the way home. And so we sit, crammed into an unimaginable yogic position in the back corner of a pickup truck, barreling down the road at eighty miles per hour. The Urubamba River shines to my right from the blaze of stars above as I try my best to eat a plate of mystery meat in the darkness of this Sacred Valley. Michael Anderson studied art and photography at the University of Minnesota and Napier University in Edinburgh, Scotland. He has a masters in Art and Art Education from Teachers College, Columbia University. He currently teaches art at Escuela Campo Alegre, an American International School in Caracas, Venezuela, and is spending some time this summer working with Aramaki’s media team in Ollantaytambo.